As you make your way to work on a winter’s day you’re thinking about how to inspire the class. It’s cold and wet and they definitely won’t be in the mood for learning. You need something new and effective to grab their attention – and keep it. Pond is here to help. Only teachers understand what it’s like in the classroom, the days of brilliance and the days of frustration. That’s why Pond was developed for teachers to use, to grow and to make their own. Pond helps you do what you already do but better, faster and easier. Pond represents clever search, recommended resources, a community of inspiring and innovative educators – helping you inspire students. It’s free crowdsourcing, at its best. As you’re aware, a small group of teachers are already in Pond in an advisory capacity; the specific and directed feedback they’ve given so far has helped N4L prepare the environment for the start of the rollout to educators. 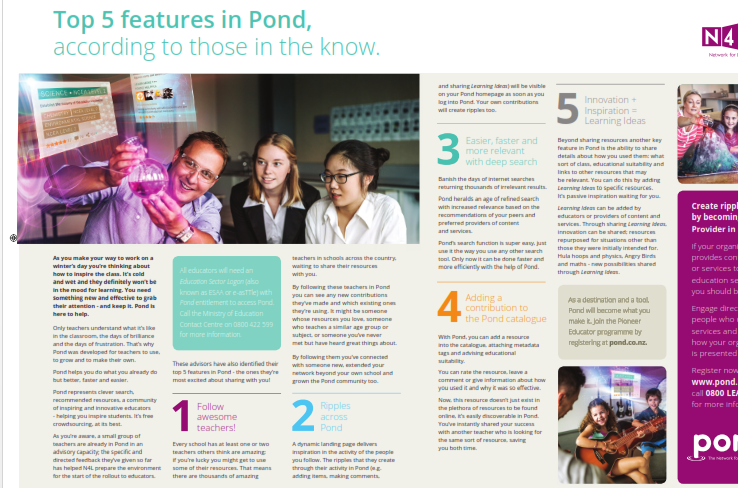 These advisors have also identified their top 5 features in Pond – the ones they’re most excited about sharing with you!